As we get older, maneuvering ourselves in and out of bed becomes riskier and more difficult. The best bed rails for seniors provide support and security from falls during the night, and make it easier to get into and out of bed safely. Adjustable product that has no contact with flooring. Free nightlight and anchoring straps. Under mattress component is non-slip and extends by three feet. Easy to assemble rail fits most sizes of bed. Designed to help people get in and out of bed. Comes with free anchoring strap and storage pouch. Strong and stable frame supports up to 250 pounds. Effective rubber coating on handle and free storage pouch. Product features adjustable depth and height to fit most beds. Sturdy product which can support up to 300 pounds. Adjustable height and width to fit many beds. Sturdy and adjustable bed rail fits most beds. Product is extendable after installation and pivots downwards. Includes storage pockets and safety strap. What Are Bed Rails for Seniors? Bed rails for seniors are metal frames that attach to a bed and usually sit in between a mattress and a bed base. They feature a handle which sits above the mattress, running parallel to the top edge of it. Bed rails for seniors provide support and security when getting in and out of bed or moving around and repositioning themselves in bed. Bed rails are suitable for people who have poor strength, balance, flexibility or endurance, and those who have difficulty moving around because of age or disability. Bed rails for seniors help to increase safety and prevent falls out of bed during the night, while also providing a secure hand hold which can be used while standing, getting in and out of bed, or repositioning yourself. How Do I Choose the Best Bed Rails? Before purchasing bed rails it’s important to check the size and type of bed you’ll be using with the product, and ensuring it fits correctly and safely. It’s important to consider whether the product will be used primarily as a support when getting in and out of bed, to prevent falling out of bed during the night, or for both issues. The dimensions of bed rails are often adjustable, and this can be useful if the product is going to be used on different sized beds. It’s important to ensure that the width of the section under the mattress doesn’t stick out of the opposite side of the bed. If you require portability for travel or moving between home and hospital, many products can be broken down to small pieces and packed flat. You must also ensure that the bed rail you select can support the user’s weight; while many products support 250 or 300 pounds, some are unfortunately not as sturdy. 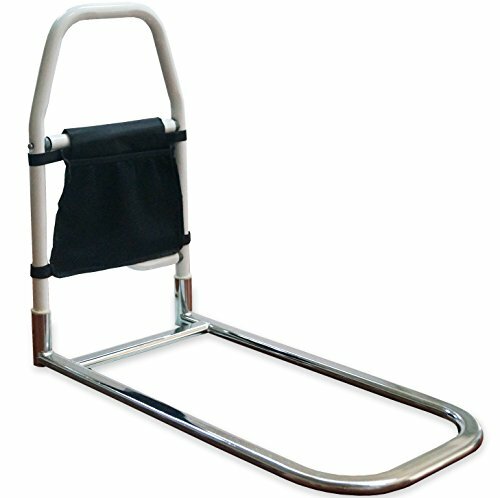 What Is the Best Way to Use Bed Rails for Seniors? Most bed rails for seniors are easy to assemble, often without any tools. Follow the manufacturer’s instructions to set up the product and install it according to their advice and the size and type of your bed. Some bed rails have floor legs which provide extra stability, while others are L-shaped with just the handrail and the section that sits under the mattress. A bed rail should be positioned at the top half of the bed, near the pillow area. This can be varied depending on the size of the user and their physical requirements. Smaller users may prefer the rail further down the bed while taller users may find it easier to move their long limbs into the bed if the rail is installed at the top of the bed! The placement of the product should be a position where the user can get themselves into bed as comfortable as possible with as few movements as possible, and it should never be placed at the foot of the bed. It’s usually best to position the rail about one-third to halfway down the bed, and reposition as required by the user. What Are the Features and Benefits of Bed Rails for Seniors? Bed rails for seniors have a number of features. Many are adjustable in order to fit different sized beds, and they often fit on either side of a bed. Most products are easy to assemble and break down to portable pieces which are easy to transport and store. The surface of the hand rail is often covered in rubber or foam padding, which provides extra comfort to the user while ensuring a firm grip for safety. A lot of bed rails for seniors come with added safety straps for securing the frame to the mattress or bed base, complementary storage pouches, and some even feature lights. Bed rails for seniors are a simple device, yet the effect they can have on an elderly person’s independence and confidence can be profound. This product allows a senior to get up in the morning and go to bed at their leisure, requiring less assistance from a caregiver. They also provide a means of support which is helpful during daytime tasks. 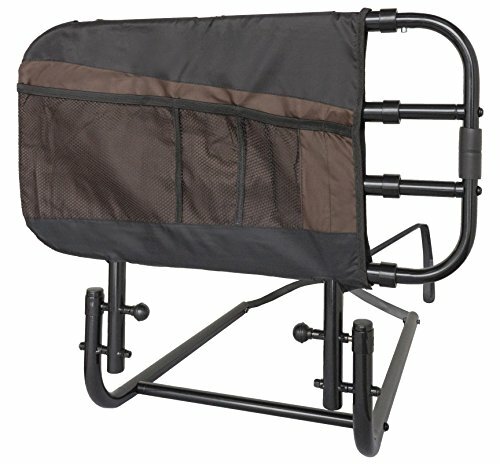 What Are the Best Bed Rails for Seniors? With a huge selection of bed rail products available, and each one with its own specific features, it can be hard to select the right product for your needs. We’ve chosen five of the best bed rails for seniors currently available, and evaluated the benefits, features and price of each model. This bed rail for seniors helps to prevent falls, and provides reassuring support when getting in and out of bed, whether you’re elderly, recovering from surgery, or simply have mobility issues. 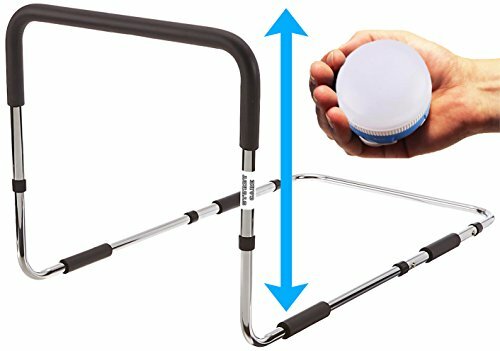 A 20-inch foam-padded handle rail provides assistance and a secure grip, and the product can support weights of up to 300 pounds. This product features an adjustable height from 17 to 21 inches, so it’s able to fit all mattress sizes, including low profile beds of less than 16 inches and platform beds with slats less than 5 inches apart. The component that sits between the mattress and the bed is non-slip, and extends by a total of 3 feet for added security. This product assembles and breaks down easily, without any tools. This bed rail also comes with an optional safety strap, and a bonus night light. The light is easy to use and has a magnetic backing, which can be attached to the bed rail or any other metal surface. Nightlight and anchoring straps included. Good support during the night. Light has too many levels and is hard to turn off. This bed rail for seniors is designed to assist people who have difficulty getting in and out of bed safely. A sturdy steel frame sits underneath the mattress and the wide design helps to keep the product in place securely. The components of this bed rail don’t require tools for assembly or installation, and anchoring straps are included to fix the product to the bed frame or base. This bed rail for seniors fits any full-size bed, as the bar that sits between the mattress and bed is extendable. The modern design of the rail will complement any decor style, and a storage pouch attached to the handrail provides a useful place to keep any items used before bed or during the night accessible. Square-shaped rail is easier to grab hold of. Small size doesn’t provide as much security for preventing falls. This model helps to prevent falls and promote the independence of the user, whether they’re an an elderly person or have limited mobility. The product’s a strong, solid structure which can support a maximum weight of 250 pounds. A heavy duty, powder-coated steel frame ensures stability and durability for many years, while also keeping the bed rail easy to clean and free from scratches. This product doesn’t require tools for assembly or installation, and it’s ready to use after sliding it underneath the mattress. With an adjustable depth and height, this bed rail will fit just about any bed. A slip-resistant handle feature ensures stability and security for the user, and the product can be stored flat as the handle’s removable. An attached storage pouch is included with this product, which allows you to keep any required or frequently used items close to hand while you’re in bed. Rubber coating on handle gives firm and cushioned grip. Manufacturing issue makes it not possible to use with some heights of bed. Some users found this product difficult to assemble. Providing a safe and secure aid to getting in and out of bed without assistance, this bed rail helps seniors, pregnant women and those with disabilities or physical limitations. Users can increase their mobility independence, and help to prevent the common problem of bedside falls. This bed rail for seniors is a strong and sturdy frame made from heavy duty powder-coated steel, and it can support up to 300 pounds. This product is fully adjustable, with a height ranging from 13 to 17 inches and a width from 34 to 44.5 inches, ensuring it can fit on any size of bed and at either side. 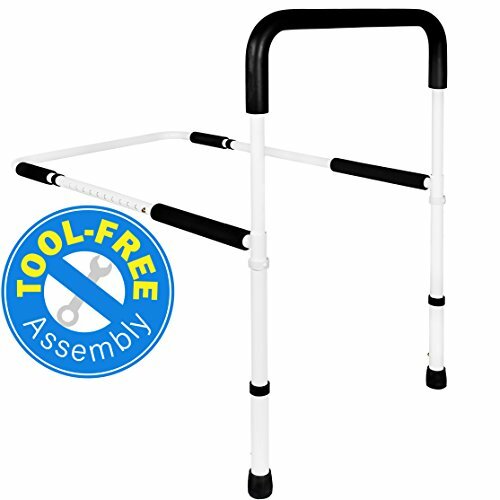 This bed rail for seniors comes in three separate pieces, and is easy to put together without any tools. Once assembled, the product just needs to be slid under the mattress, and wiped down when cleaning is required. Foam padding and a slip-resistant handle, along with floor-standing legs and horizontal stabiliser bars ensure maximum stability and support for the user. Padding on handle provides secure grip. Support bar sits far inside the mattress gap for security. Doesn’t work with mattresses under 5 inches in height. Doesn’t fold flat for storage. Too high for many beds. This bed rail for seniors has an adjustable length of 26 to 42 inches, so it can be used as a handrail to help with maneuvering in and out of bed, or a bed rail to help prevent falls out of bed. This product can be used on either side of the bed, and fits mattress heights between 12 and 18 inches. This bed rail also measures 23 inches wide and 24 inches high so can be used with most traditional and adjustable beds including platform beds with lengthwise slats, or widthwise slats with gaps of less than 5 inches. This product is easy to assemble with a wrench, and also includes an added safety strap. This bed rail for seniors is one of the most versatile on the market, as the patented design mean the rail can be extended in length after installation, and also pivots downwards to help make getting out of bed and making the bed much easier. Extendable and pivoting bed rail. Easy to adjust rail length after installation. Can’t be used with light foam mattresses or beds with no box spring. Product caused injury for one user. Safety strap prone to breaking. After assessing five products on their features, quality and price, in our opinion the best bed frame for seniors is the Sturdy Care Bed Rails for Elderly with Bonus Magnetic Light. 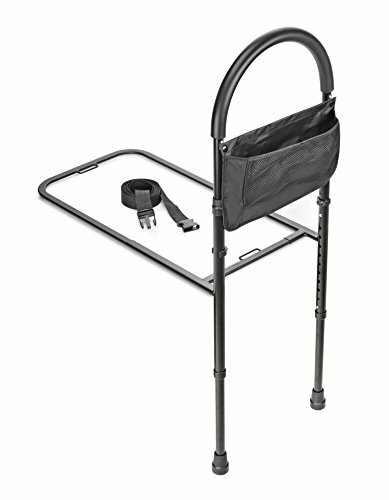 This product is a good size for both assisting people in and out of bed, and preventing falls during the night. Although the unit doesn’t have legs, the component which sits between the bed and mattress is non-slip, extendable by 3 feet, and fully secured by the anchoring straps. The Sturdy Care bed rail is high quality, with no manufacturing issues found, unlike other products. It’s also much more cost effective than the Stander EZ rail and the Medokare bed rails. This combination of functionality, security, quality and value for money make the Sturdy Care Bed Rails for Elderly with Bonus Magnetic Light the best bed rails for elderly currently available. What is the Best Water Rowing Machine in 2019?